(Miami, FL – Sept. 16, 2016) Miami-Dade added nearly 12,000 jobs from August 2015 to August 2016 with growth in the construction sector leading (11.2 percent), followed by financial activities sector (4.3 percent) and professional services (1.7 percent), according to statistics released Friday. Miami-Dade County created 11,700 new nonagricultural payroll jobs (not seasonally adjusted), from August 2015 to August 2016 which was a 1 percent increase. Miami-Dade County continues to show year over year gains. Improvements in the non-farm payroll jobs can be found in a variety of sectors. Between July 2016 and August 2016, Miami-Dade County increased nonagricultural payroll jobs by 7,800 or a 0.7 percent increase. The not seasonally adjusted unemployment rate for Miami- Dade County was 5.6 in August 2016, which was a 0.8 percentage point decrease from August 2015 at 6.4 percent, and 0.2 percentage point increase from July 2016 at 5.4 percent. 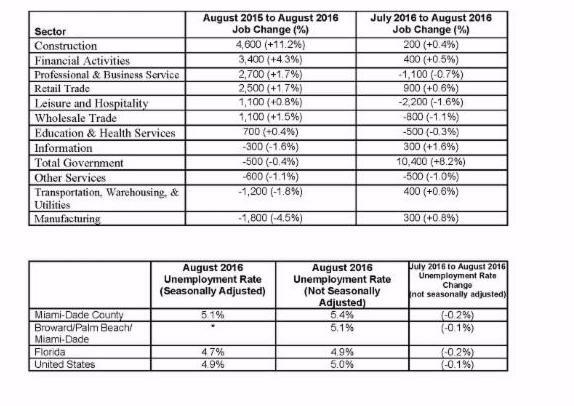 In August 2016, the seasonally adjusted unemployment rate for Miami-Dade County (taking seasonal fluctuations in the labor force into consideration) was 5.1 percent, which is 0.1 percentage points lower than July 2016 at 5.2 percent, and a 0.8 percentage point decrease from August 2015 at 5.9 percent. The large increase in payroll jobs in government can be attributed to the rehiring of personnel at Miami-Dade County Public Schools. About half of the employees are on a 10-month contract. Although these employees will not collect unemployment during the two summer months, they are counted as not working, hence the drop in the June data for government and the increase in the August data. From the data and analysis above, we see continued improvement in the local economy. Nevertheless, the community needs to remain focused on job-creation projects in targeted industries. These industries have been identified as the Miami-Dade County industries most able to create additional well-paying job opportunities, leading to an improved quality of life for Miami-Dade County residents. The Miami-Dade Beacon Council continues to aggressively work on attracting new companies to our community and work on the expansion and retention of existing business. Find out more at www.beaconcouncil.com.